Quadro is a young and dynamic company – managed by young people too – born with the necessity to offer solutions rather than products. 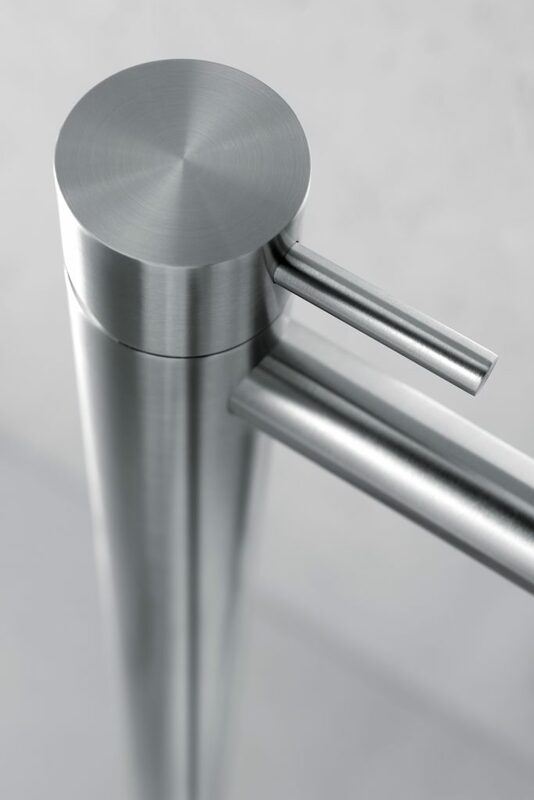 We innovate because we choose to combine noble and sophisticated materials such as stainless steel together with an essential, timeless, archetypal design. In our design and development process, the ecological impact is always taken into consideration in addition to design, function and economics. For this is where the most important factors are already determined that set the course for the selection of materials, the manufacturing process, options for assembly, logistics and transport, reparability and return to the materials cycle. This overview shows the key aspects for the entire product life cycle that are currently applicable to Quadro. We focus on people. This implies a cooperative style of management that recognize employees representatives as being co creators of the daily life in the company. The use of a noble raw material such as stainless steel aisi304 and aisi316L, the flow regulators aerators Perlator® honeycomb, carton neutral packages are some of the various product components that guarantee the respect of the environment in which we all live in. Quadro products are certified according to main internationally relevant testing and inspecting standards regarding product safety and functional integrity. Sustainable products must be purposive. The timeless archetypal design of Hans Thyge Raunkjaer and Studio Adolini includes their useful intuitively operable functions and the enduring of quality of materials. Recyclable materials are preferred as more durable and environment-friendly, and all are subject to stringent quality controls. The ranges set standards for product design that is sustainable in the most optimal way. The durability of the high-quality materials used, the innovative functional concepts and the archetypical understated design guarantee usability for many decades. We ensure a 5 years manufacturers guarantee on the cartridge, thus providing a serious planning and a very specific time frame. Total trust in product design. The principles of the eco-design are a natural and integral part of the creation and development of our product.